LG is so proud of its new, "Super Bright" display technology on the freshly-minted G7 ThinQ, that it walked us through it even before the phone was officially released. Why Super Bright? Well, how does peak brightness of 1000 nits sound to you? If it sounds like nothing in particular, be informed that this is twice as high as the level of peak brightness we consider excellent on other phones. The best part is that this is uniform illumination we are talking about here, as the G7 comes with LCD, not OLED display. Granted, OLEDs can go very high, too, but at spot measuring and in certain conditions, whereas the backlight of the G7 can get an immense boost for long periods, making it perfect for beach days. How did LG do it? Instead of the usual red-green-blue RGB dot matrix, LG lists the G7 display as RGBW, adding... white pixels, of course. Traditionally, the light has to pass through all three pixels, and mix various proportions of red, green and blue that form white, but with adding a white one, the light actually passes directly through it for the purpose. Thus, you can either save 50% of the backlight energy required to pass through all three pixels in RGB matrices, or have twice the luminosity at peak brightness. Brightness, together with screen reflectance ratio, are the two variables on which outdoor visibility depends, and raising one of those, while keeping the other intact, will result in much better sunlight visibility still. When outside on a sunny day, we all know how frustrating it is to try and use your smartphone, whose screen all of a sudden pales in comparison with the rays pouring on it. 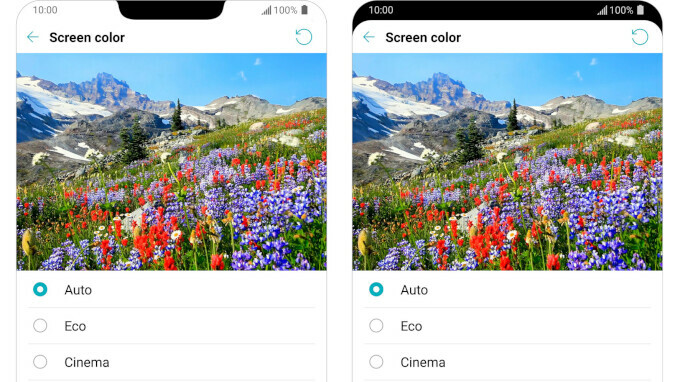 The LG G7's ambient light sensor can then rev up the brightness to its maximum 1000 nits level, making the screen more visible in direct sunlight. When indoors or on a cloudy day, the sensor tones down brightness to the typical LCD screen levels, consuming much less energy. The G7 can keep this Super Bright mode for up to three minutes, so that you can keep doing what you are doing under the scorching sun, and the mode can be switched on again at will. The G7 is not the first phone that can hit 1000 nits of peak brightness, as Nokia 701 and Sony's White Magic displays went the RGBW-ay, too, but it's the first modern phone with 6" QHD+ 19.5:9 FullVision Super Bright 564ppi HDR display to do so. We kid, but will save judgment for when we run our in-house screen benchmarks on the G7 display's numerous color modes, then take LG's newest flagship to the beach. Mate 10 has RGB-RGBW. XZ2 Premium is WRGB too. Big sponsor time. floods all the news. PA must be wet with $$$$$ from lg at this time. The screen indeed sounds pretty impressive. Modern LCD panels are already more efficient than AMOLED panels since Samsung hasn't improved efficiency by even a single % since S7, and is only improving quality. This one improves on that by 35%!! Not to mention full 10-bit color support, and the full RGBW matrix. LG's IPS displays have traditionally been pretty solid, but this should be one to see. Alas, it will all be offset by the puny battery capacity LG has put on this phone, while increasing screen size and display resolution (sigh). In manual mode, yes. In auto mode it can go beyond 600 nits. S9+ has 1130 nits. Check display mate website. Can't wait to see how battery life is on the G7. Hope the mlcd+ is good on battery. Really, you can't expect much from a huge screen and a 3000 mAh battery, no matter how efficient it is. I predict a disappointing result. Peak brightness has been measured at full white screen, so those extra white subpixels improves it. But what happens with colorful content? Say at a full red or a full green or a full blue screens? I don't think other than white content brightness will be greater than a regular RGB LCD. RGBW is around for years, if it was that good I suppose RGB LCD would be long dead. Their TVs are WRGB oled. RGBW screens are nothing new. The problem is, most of them suffered from a really bad contrast rate. Waiting for the tests to see if LG managed to fix that. Regular mate 10 can reach almost 1500 of contrast ratio. It has rgbw too.